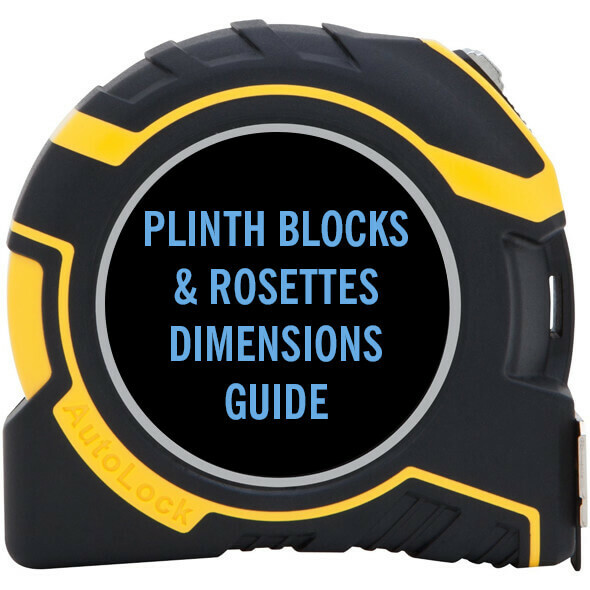 This guide will help you identify which dimension refers to which part of a plinth block or rosette. Plinth blocks and rosettes have three dimensions which will need to be specified. These are the: height, width and thickness/depth of the blocks. Bear in mind that plinth blocks and rosettes are usually taller and wider than their surrounding mouldings, which creates a pronounced effect around your doorway. Plinth blocks are usually at least 10mm taller than skirting boards, and can look better if taller still. They are also usually wider than their adjoining architrave by around 5-10mm. Our plinth block come in a larger or a smaller size, so you can cut them down to the size that you would like. Rosettes are square and are normally equally wider and taller than their surrounding architrave by 5mm-10mm. This gives a centred appearance. All of our plinth blocks and rosettes are designed with this in mind, and will complement our skirting board and architrave sizes in this way. This is how tall the block will be. this is measured from the top edge of the block to the bottom edge. This is how far the block will run along the wall from left to right. This is how thick/deep the rail will be, when measuring from the back edge to the front edge, or from the wall outwards.